The Kansas City Cowboys were admitted to the American Association on January 17, 1888, after the New York Metropolitans folded. The Brooklyn Dodgers purchased what remained of the Mets, hoping to obtain the services of the now-unemployed New York players. The Cowboys, meanwhile, would have a rough inaugural season, finishing with a 43-89 record, putting them in last place in the AA. Deacon McGuire was a baseball player, coach, and manager in the major leagues during the late-19th and early-20th centuries. His professional career began in 1883 at the age of 19, and lasted until 1915. He was known as the most durable catcher of his time, setting major league records for most career games caught (1,612), putouts (6,856), assists (1,860), double plays turned (143), runners caught stealing (1,459), and stolen bases allowed (2,529). James Thomas McGuire was born in Youngstown, Ohio on November 18, 1863, during the Civil War. He grew up in Cleveland, where he learned to play baseball on the streets, then later moved to Albion, Michigan where he worked as an apprentice iron molder, playing baseball during the weekends. His large hands proved ideal for playing catcher. Playing baseball for a team in Hastings, Michigan, McGuire first drew attention catching for a pitcher named Charles “Lady” Baldwin. Baldwin was known for his “snake ball,” and McGuire gained a reputation as the only catcher who could handle the pitch. In 1883, McGuire began his professional career with the minor league Terre Haute Awkwards in Indiana. 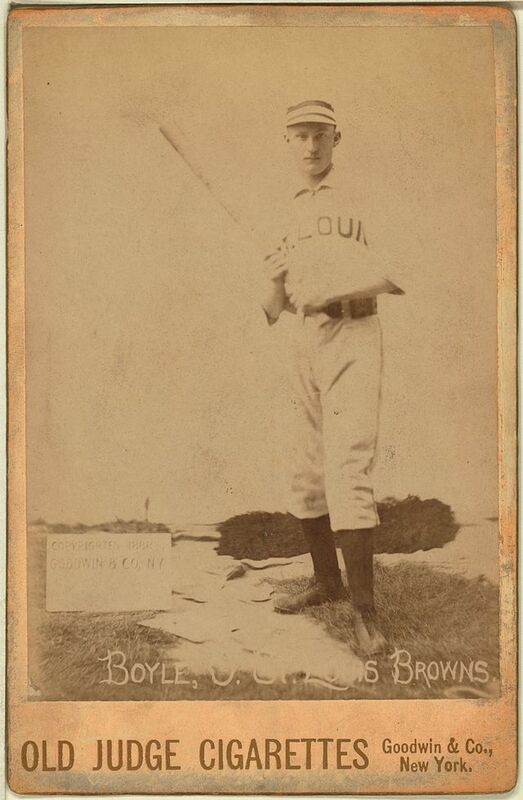 In 1884, McGuire signed with the Cleveland Blues of the National League. He was released shortly thereafter, however, and signed with the Toledo Blue Stockings of the American Association. He made his major league debut with the Blue Stockings in June of 1884. He shared the catching responsibilities with Moses Fleetwood Walker, who is credited as being one of the first African-American players in Major League Baseball, each catching 41 games. McGuire only hit .185 at the plate, and the Blue Stockings came in eighth place out of thirteen with a 46-58 record. Starting out the 1885 season, McGuire played 16 games with the minor league Indianapolis Hoosiers of the Western League. He and eight of his teammates then signed with the Detroit Wolverines of the National League, upon the disbanding of the Western League. With the Wolverines, McGuire caught 31 games as backup to primary catcher Charlie Bennett, who caught 62 games. McGuire hit .190 in 121 at bats, and the Wolverines finished 41-67. McGuire then spent the 1886 and 1887 seasons with the Philadelphia Quakers. While 1886 proved another poor offensive season for McGuire, hitting .198, the 1887 season proved to be a year of dramatic improvement, as he hit .307 in 150 at-bats. His two-year stint with a single team came to a close as 1888 saw him bounce from Philadelphia for 12 games, back to Detroit for three games, then onto Cleveland for 26 games. 1889 saw McGuire return to the minors with the Toronto Canucks of the International League, where he batted .282 in 93 games. 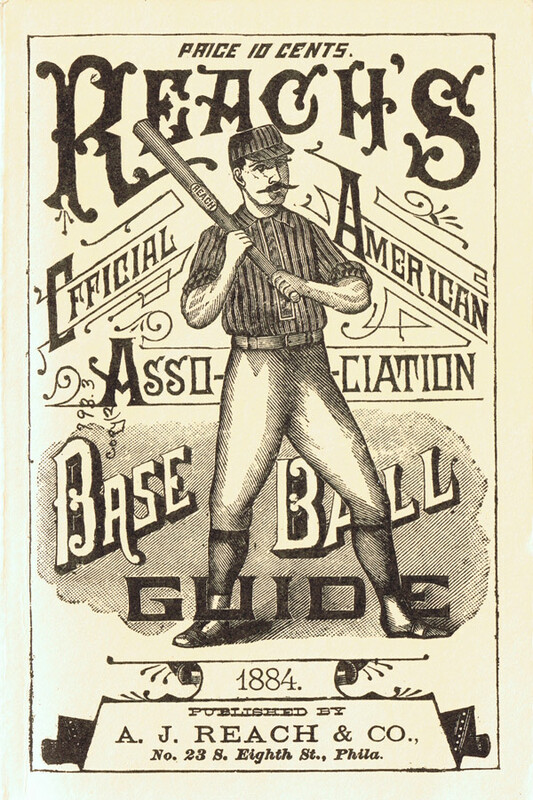 In 1890, McGuire returned to the big leagues with the Rochester Broncos of the American Association. He batted .299 with a .356 on-base percentage, .408 slugging, and 53 RBIs. In 1891, he joined the Washington Statesmen of the American Association (which later became the Senators of the National League), where he would finally stay for nine seasons. He led all starters in batting with a .303 average in 1891. In 1892, however, he only hit .232 and led the league’s catchers in stolen bases allowed. The Senators finished that season in 10th place out of twelve teams. The 1893 season saw McGuire splitting time at catcher with Duke Farrell, playing 50 games behind the plate while Farrell caught 81. In spite of his limited playing time, McGuire committed 27 errors and the Senators finished in last place with a 40–89 record. Farrell was traded to the New York Giants in 1894, leaving McGuire to carry the catching load. McGuire’s performance at the plate experienced a recovery, as he hit .306 with 78 RBIs for the 11th-place Senators. The following season, 1895, would prove the best of his career. In 1895, McGuire caught all 133 games of the season, which set a major league record at the time. He led the team with a .336 batting average, which included 48 extra bases hits, 10 home runs, 97 RBIs (which also led the team), and 17 stolen bases. He also threw out 189 base runners attempting to steal, a record that stands to this day. Unfortunately, the Senators as a team didn’t fare nearly as well, finishing the season 43-85 and in tenth place. McGuire had another solid season in 1896. He hit .321 and led the majors in games caught at 98 (Duke Farrell had been traded back to Washington, this time as McGuire’s backup). He led the National League in putouts; however, he also led the NL in errors and stolen bases allowed. That year, the Senators finished in ninth place at 58-73. In 1897, McGuire caught 73 games to Farrell’s 63. Both catchers had a solid year at the plate, as McGuire hit .343 and Farrell hit .322. The team improved to 61-71, which put them in sixth place. McGuire’s performance waned in the 1898 season, hitting .268. After beginning 1899 with the Senators, McGuire found out in July that he had been traded to the star-studded Brooklyn Superbas, joining Duke Farrell yet again. He hit .318 in 46 contests with Brooklyn, posting a .385 on-base percentage and .446 slugging. The team finished 101–47 to win the National League pennant. In 1900, McGuire once again shared catching responsibility with Farrell, with McGuire handling 69 games at the position and Farrell 76. McGuire finished with a .286 batting average and .348 on-base percentage. During one game in 1900, McGuire threw out seven runners attempting to steal second base. Brooklyn won its second consecutive pennant with a 82–54 record. Brooklyn dropped to third place in 1901 with McGuire hitting .296 and catching 81 games. Then in 1902, McGuire was traded to Detroit in the American League, where he was the oldest player on the team at the age of 38. He caught 70 games and hit .227. He raised his batting average to .250 in 1902, but Detroit was never a contending team. In February 1904, Detroit sold McGuire to the New York Highlanders, where he spent his final years as a full-time player. In spite of the fact that he was now 40 years old, he caught 97 games and played in 101 total, though his batting average fell to .208. In 1905, he caught 71 games and hit .219, and in 1906, McGuire played in 51 games and hit .299. After taking a year to open a saloon with his brother George, McGuire joined the Boston Red Sox in 1907, primarily as a manager. The team finished 45–61 in 1907 and 53–62 in 1908, with McGuire making occasional playing appearances as a pinch hitter. In September of 1908, he signed on with the Cleveland Indians, first as a player. He took over as manager in 1909, replacing Nap Lajoie partway through the season. In 1910 McGuire managed his only full season, as the Cleveland club finished 71-81 and came in fifth place. He caught one game, going 1-for-3 at the plate. In 1911, McGuire resigned after the club started with a 6-11 record and would never manage in the big leagues again. In 1912, McGuire signed with the Detroit Tigers as a pitching coach. In May of 1912, when the Detroit players refused to play in protest over the suspension of Ty Cobb for attacking a fan, Detroit was forced to come up with a substitute team for a game in Philadelphia. McGuire took to the field as one of the Tigers’ replacement players. He went 1-for-2 and scored a run in what would be his final major league game, but the Tigers lost the game by a score of 24–2. McGuire served as a coach with the Tigers until 1915 and he remained associated with the club as a scout until he fully retired in 1926. He returned to Albion, where he coached the Albion College team in 1926. Finally, he retired from baseball altogether. Jim McGuire’s nickname “Deacon” supposedly came from his gentlemanly, fair-play approach to the game. Most accounts support the widely-held claim that he was never fined or ejected from a game. According to some sources, he never drank, though according to others, he had been a heavy drinker for years before becoming a teetotaler. He wasn’t a flamboyant player, but he had a reputation for being a hard worker, and was considered a legend in his hometown of Albion. This was a time, of course, that predated the advent of padded catcher’s mitts and other modern protective equipment. To help protect his hands, McGuire was reported to have slipped a piece of steak into his glove. According to his wife, the steak resembled hamburger by game’s end. McGuire died of pneumonia in 1936 at the age of 72. 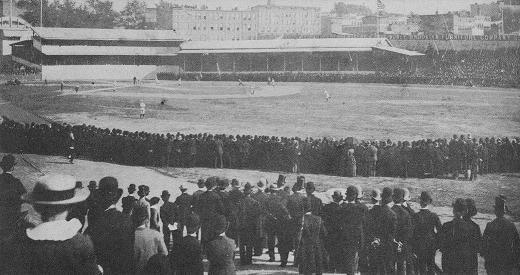 Weakened by the tendency of teams and players to jump to the National League, as well as by the formation of the Players’ League, the American Association disbanded on December 17, 1891. Several AA teams, including the Baltimore Orioles, the St. Louis Browns, and the Washington Senators, joined the NL following the collapse of the American Association. You can read more about the American Association here.